Sometimes I get ideas that I need to follow through with, even though I'm not sure why. Materials - One and a half packages of beef jerky ( I ate the other half ). 12 inches tall. I got him to balance for about a minute at a time. Just long enough to take a few photos. 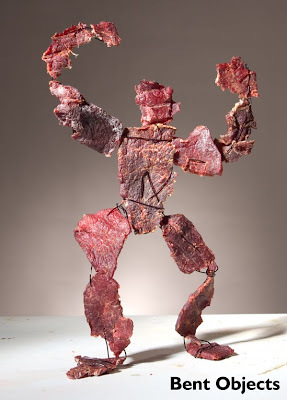 This may be the first jerky sculpture on the internet. I couldn't find any others in a quick search. I found a dried beef dress, but nothing else. If it is the first, then goody for me, and I deserve some kind of prize, like a couple of packages of good beef jerky. Feel free to send me some. Edit Feb. 9 - Thanks to Joe for commenting and leaving this link. This film was on my mind when I was making this jerky guy.